illus. by Jon Agee. 48p. Dial. Oct. 2018. Tr $17.99. ISBN 9780525555452. PreS-Gr 3—There's a wall in the middle of this book. And it's a good thing, because it protects one side of the book from the other side. Or, at least that's what the hero of the book, a young knight, thinks. As the knight warns readers about all of the dangers on the other side of the wall—like tigers and mean ogres—he remains oblivious to the rising water and crocodile who are sneaking up behind him on his side of the wall. Before the water engulfs him completely, the knight is rescued by a surprising savior, and he soon learns that things may not be so bad on the other side of the wall after all. The knight's journey reminds readers that instead of building walls, we should be tearing them down in order to understand who or what is on the other side. 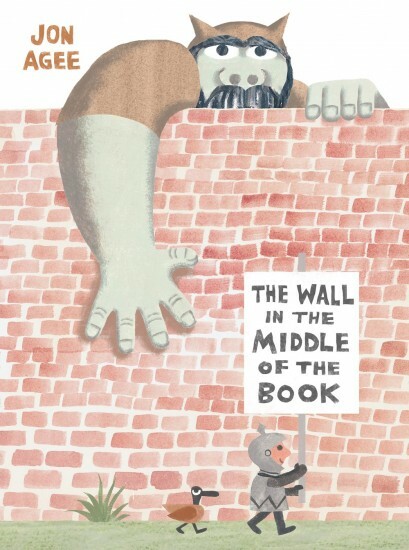 Agee's simple illustrations combined with his trademark humor and ability to let readers in on a secret that the protagonist knows nothing about, combine to solidify him as a hilarious picture book master. VERDICT A silly read-aloud with an important message. A solid choice for storytime and one-on-one sharing.